Indoor Outdoor Kit made by natural pest control leader "Natures Defender / Best Yet"
Every thing you need to rid yourself, your kids, grand kids, pets, home & yard of Fleas, Ticks, Bed Bugs, Lice, Mites and other parasites. Whether it's one bug bothering you or even a full blown infestation! Kill Scorpions, Roaches, Ants, Silverfish and many, many other pests! AND an array of other biting and flying pests. THE PRODUCT OF CHOICE BY MAJOR HOTELS FOR BED BUG CONTROL. BEST YET can be used on babies of ANY species, including newborn puppies and kittens. The unique formulation prohibits solution migration into the bloodstream and subsequently, unlike DEET products, has ZERO effect on your nervous system. BEST YET can be used for the treatment of all types wood, cloth & leather furniture, bed and mattress, carpets and any other surface. Will not stain or attract dirt. 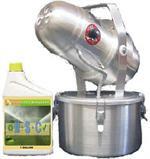 a 1 quart adjustable nozzle spray bottle filled with best yet. a 1 gallon jug filled with best yet for use in the included sprayers, in fogging machines, or even as a refill to the spray bottle! 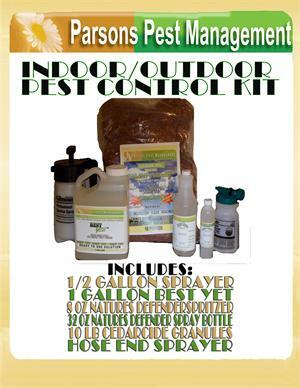 AND a 10 lb bag of granules from a leader in natural pest control, Cedarcide! To use just apply a fine mist from any of the three sprayers. Contact with most insects will trigger immediate death. The pheromone interruption agents in Cedar Oil will create a barrier of entry making areas treated with BEST YET off limits to pests. Proven superior to any chemical counterpart available. Apply at a rate of 1 gallon per 1000 square foot surface area if using the compression sprayer. Not for use on plant life.